London : T.F. Unwin ; New York : C. Scribner, 1895. Third edition. Quarto. Modern tan cloth, brown leather spine labels, top edge gilt, new endpapers. Fine binding and cover. Scattered foxing, light mildew stain to last 6 pages. "Mummery was an expert rock-climber and alpinist who made many important climbs in the Mont Blanc region. 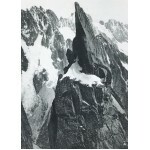 He led an expedition to Nanga Parbat in 1895, with Collie and Bruce, and disappeared whilst reconnoitring." Neate M181.